Russia has held international competitions of tank and aircraft crews over the past two years, and the famous annual Tank Biathlon is expected to become the most important part of the Army Games. 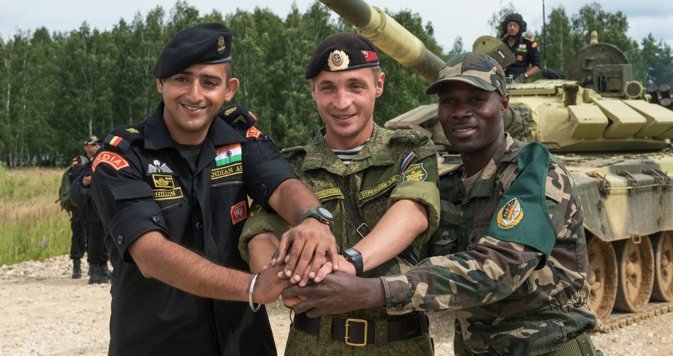 Participants of this year's International Army Games include: Azerbaijan, Angola, Armenia, Belarus, China, Egypt, India, Kazakhstan, Kuwait, Kyrgyzstan, Mongolia, Nicaragua, Pakistan, Serbia, Tajikistan, Venezuela, as well as Russia. Teams will participate in 14 military contests, which, along with the Tank Biathlon, will include competitions for military engineers, pilots and drivers, air defense specialists, sappers, paratroopers, military chemists, artillery crews, and even army cooks. The contests will be held in 11 different locations across Russia. More than 2,000 foreign troops are expected to take part in the games, with 400 foreign observers also due to attend the event. Tank crews from four continents have arrived at a firing range in Alabino near Moscow, to take part in the World Championship Tank Biathlon 2015. Thirteen will participate using the Russian-made T-72B3 tanks. The Chinese team has arrived in Moscow with their own tank, the Type 96A. The vast territory and rugged terrain of Alabino allowed to create a full-scale simulation of combat operations for the competitions. Obstacles, sites and buildings on the site were developed especially for the Army Games. The contest route for tanks is expected to be more difficult this year with additional obstacles and new shooting practice tests. The Aviadarts is an annual competition of flight skills and precise shooting, first held in Russia in 2013. The competition will start on August 2. According to the Russian Defense Ministry, more than 50 crews from Russia, Belarus, China and Kazakhstan will be competing. All participants will use their armed forces' aircraft for the competition. Over 100 pilots, 12 types of planes and helicopters and three airports throughout Russia will be involved. The contest includes competitions for fighter, bomber, attack, army, military transport and long-range aircraft. Participants will be judged on the accuracy of the firing of rockets and air guns. The Aviadarts part of the Army Games will include an aviation show with flight demonstrations. Motorized infantry units will show off-road driving skills during the Suvorov Onslaught contest, named after a renowned Russian 18th century military commander. The Masters of Automobile and Tank Hardware will see military drivers and mobile repair teams compete on day and night routes. The Masters of Artillery Fire will define the fastest and most accurate artillery crew in a competition at a firing range. During the Masters of Air Defense part, contestants will vie in passing a cross-country route and firing from portable anti-aircraft system on moving targets. Nuclear, biological and chemical reconnaissance units will compete during the Safe Environment contest and engineering troops will vie in the fields of the Safe Route. As part of the Caspian Derby contest, marines from CIS member states will compete at the Adanak Range on the Caspian Sea coast, whereas the Caspian Cup will define the winner between ship crews in a contest held in the sea itself. The Airborne Platoon contest will see Russian and foreign paratroopers compete in skills such as parachute landing, firing accuracy, speed and agility. During the Masters of Reconnaissance, contestants will have to perform air landing, obstacle crossing and show driving skills. The Open Water competition will see teams overcoming water obstacles, building ferries to deliver combat vehicles to a destination. Finally, military cooks will show their skills in preparation of food in diverse conditions during the Field Kitchen contest.